I've played a bit with Hugo, the static web site generator written in golang that has been getting a lot of good press lately. At the suggestion of my colleague Warren Runk, I also experimented with hosting the static files generated by Hugo on Google Cloud Storage (GCS). That way there is no need for launching any instances that would serve those files. You can achieve this by using AWS S3 as well of course. You first need to sign up for a Google Cloud Platform (GCP) account. You get a 30-day free trial with a new account. Once you are logged into the Google Cloud console, you need to create a new project. Let's call it my-gcs-hugo-project. You need to also create a bucket in GCS. If you want to serve your site automatically out of this bucket, you need to give the bucket the same name as your site. Let's assume you call the bucket hugotest.mydomain.com. You will have to verify that you own mydomain.com either by creating a special CNAME in the DNS zone file for mydomain.com pointing to google.com, or by adding a special META tag to the HTML file served at hugotest.mydomain.com (you can achieve the latter by temporarily CNAME-ing hugotest to www.mydomain.com and adding the HEAD tag to the home page for www). If you need to automate deployments to GCS, it's a good idea to create a GCP Service Account. Click on the 'hamburger' menu in the upper left of the GCP console, then go to Permissions, then Service Accounts. Create a new service account and download its private key in JSON format (the key will be called something like my-gcs-hugo-project-a37b5acd7bc5.json. Let's say your service account is called my-gcp-service-account1. The account will automatically be assigned an email address similar to my-gcp-service-account1@my-gcs-hugo-project.iam.gserviceaccount.com. 2) Copied the service account's private key my-gcs-hugo-project-a37b5acd7bc5.json to the .ssh directory of the jenkins user. It looks like you are trying to run "/var/lib/jenkins/google-cloud-sdk/bin/bootstrapping/gsutil.py config". The "config" command is no longer needed with the Cloud SDK. The first gsutil command does a recursive copy (cp -r *) of all files to the bucket. This will preserve the directory structure of the website. For testing purposes, the gsutil command also sets the Cache-Control header on all files to private, which tells browsers not to cache the files. The second gsutil command is executed for each object in the bucket, and it sets the ACL on that object so that the object has Read (R) permissions for allUsers (by default only owners and other specifically assigned users have Read permissions). This is because we want to serve a public website out of our GCS bucket. 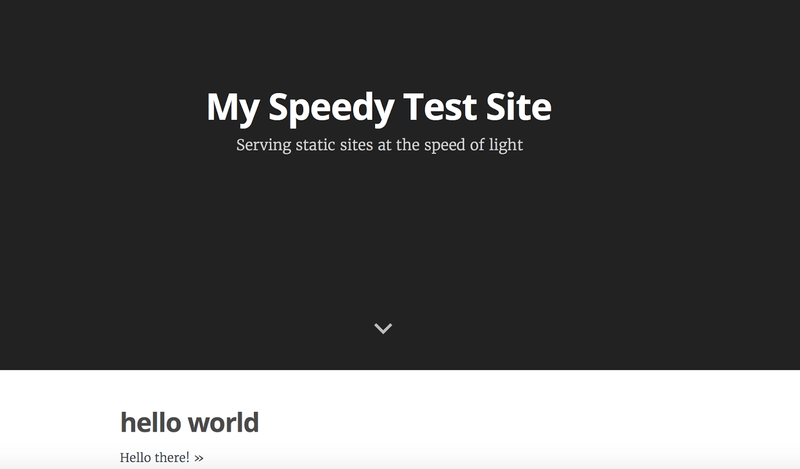 At this point, you should be able to hit hugotest.mydomain.com in a browser and see your static site in all its glory. I've only dabbled in Hugo in the last couple of weeks, so these are very introductory-type notes. $ ln -s ../themes . 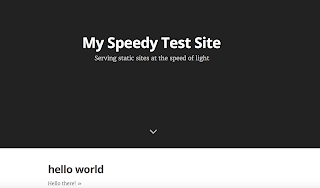 title = "My Speedy Test Site"
description = "Serving static sites at the speed of light"
# author = "Valère JEANTET"
# authorlocation = "Paris, France"
I left most of the Casper-specific options commented out and only specified a cover image, a logo and a description. If you want blog-style posts to appear on your home page, create a new page with Hugo under a directory called post (some themes want this directory to be named post and others want it posts, so check what the theme expects). Now add some content to that file and save it. Note that the draft property is set to false by the Casper theme. Other themes set it to true, in which case it would not be published by Hugo by default. The slug property is set by Casper to "post-title" by default. I changed it to "hello-world". I also changed the tags list to only contain one tag I called "blog". That's quite a number of files and directories created by hugo. Most of it is boilerplate coming from the theme. Our hello-world.md file was turned into a directory called hello-world under public/post, with an index.html file dropped in it. Note that the Casper theme names the hello-world directory after the slug property in the hello-world.md file. Not bad for a few minutes of work. Note that the menu property value is "main" in this case. This tells the Casper theme to create a link to this page in the main drop-down menu available on the home page. To deploy your site to GCS, S3 or regular servers, you need to upload the files and directories under the public directory. It's that simple. I'll stop here with my Hugo notes. DigitalOcean has a great tutorial on installing and running Hugo on Ubuntu 14.04. Some quick notes I jotted down while documenting our Ansible setup. Maybe they will be helpful for people new to Ansible. Playbooks are YAML files that specify which roles are applied to hosts of certain type. This says that for each host in the api group we will run tasks defined in the roles listed above. defaults - contains the main.yml file which defines default values for variables used throughout other role files; note that the role’s files are checked in to GitHub, so these values shouldn’t contain secrets such as passwords, API keys etc. For those types of variables, use group_vars or host_vars files which will be discussed below. handlers - contains the main.yml file which defines actions such as stopping/starting/restarting services such as nginx, rsyslog etc. meta - metadata about the role; things like author, description etc. hosts/myhosts - this is an INI-type file which defines groups of hosts. For example the following snippet of this file defines 2 groups called api and magento. The api-servers.yml playbook file referenced at the beginning of this document sets the hosts variable to the api group, so all Ansible tasks will get run against the hosts included in that group. In the hosts/myhosts file above, these hosts are api01 and api02. group_vars/somegroupname - this is where variables with ‘secret’ values get defined for a specific group called somegroupname. The group_vars directory is not checked into GitHub. somegroupname needs to exactly correspond to the group defined in hosts/myhosts. host_vars/somehostname - this is where variables with ‘secret’ values get defined for a specific host called somehostname. The host_vars directory is not checked into GitHub. somehostname needs to exactly correspond to a host defined in hosts/myhosts. This overrides the insert_sample_data variable and sets it to false only for the host called api02. This could also be used for differentiating between a DB master and slave for example. The name that ties together the hosts/myhosts file, the api-servers.yml file and the group_vars/groupname file is in this case api.